I’ve always considered eggs to be one of the best comfort foods. Whether poached, soft-boiled, fried and layered on toast or in an egg salad, they never fail to satisfy–breakfast, lunch or dinner. 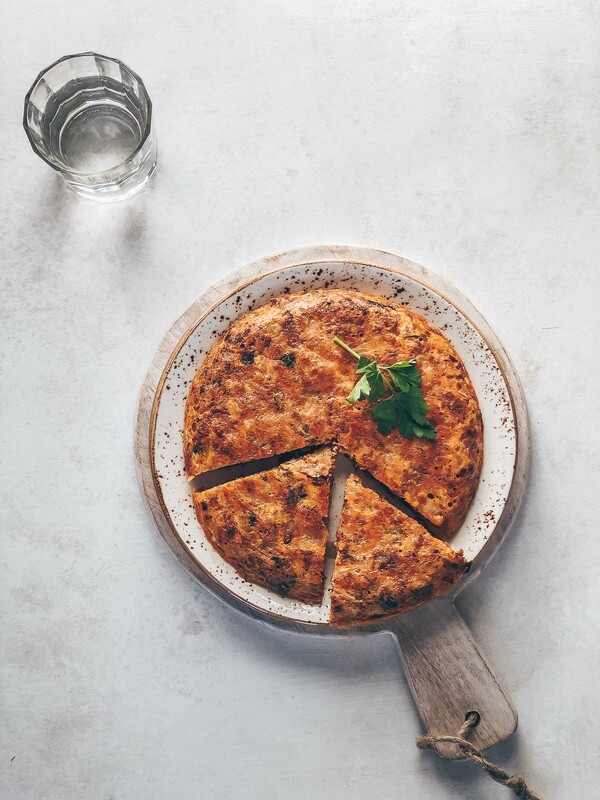 Frittatas come in handy for incorporating leftover meats and vegetables–the version I grew up with, Filipino torta, was often filled with leftover cooked ground meat or seafood. This weekend I made a frittata using random vegetables. There’s nothing at all unique about this recipe apart from the way I prepared it. Seeing that the vegetables I wanted to use were all similar in size and shape (if sliced crosswise) I decided to layer them in my tiny cast iron skillet like a tian. A tian is of Provencal origins, layered vegetables baked in a shallow earthenware dish. I have always liked the alternating arrangement and colors of the vegetables–so pretty when served. This is what I’ve done here with my vegetables (baby potatoes, brussels sprouts and Chinese Eggplant). I was in the mood for attempting something pretty and since I already had the oven going, I decided to throw in the skillet with the vegetables, too. If you’re cooking for one like I’ve done here, don’t feel the need to preheat your oven for such a small dish. Save this recipe for when you have leftover roasted vegetables or if you are planning to use the oven for another project. The results will not only be tasty, they’ll also be quite pretty. This looks burned but it wasn’t. I had a lot of cheddar on top and it browned pretty quickly. The inside was perfectly set. This is a simple vegetable frittata made just a little prettier by layering thinly-sliced vegetables on the bottom of a cast iron skillet. If you don't already have roasted vegetables, arrange the slices in a single layer on a small cast iron skillet (mine was about 5 inches). Brush with olive oil and roast at 375℉ for 20-25 minutes. Meanwhile, lightly whisk the eggs and milk together in a small bowl. Season with salt and pepper. 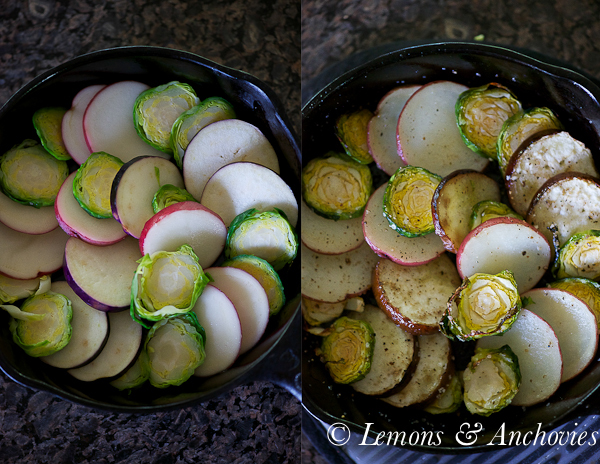 When the vegetables have roasted, take the skillet out of the oven and transfer to the stove. Add the egg/milk mixture to the skillet followed by the cheese. There should be enough oil to keep the eggs from sticking to the skillet but if you feel the need to add more, just add a splash, shake the pan to distribute to the bottom and brush on the sides. Cook the frittata over medium heat for about 2 minutes. You want the bottom and sides to set but the middle should still be jiggly. Transfer the skillet to your broiler and cook until the top is set. This may take 1-2 minutes depending on how close your skillet is to the heating element and how powerful your broiler is. Alternatively, you can cook the frittata completely on the skillet. Just cover the skillet until the center is set and the cheese has melted. Serve warm or at room temperature. Add the egg/milk to skillet then grated cheese and cook over medium heat for about 2 minutes, until set. middle will still be quite runny. Transfer to broiler--broil for 2 minutes, depending on power of your broiler. watch closely! Oooh, frittatas and quiches are so under appreciated in my book. And they really can be this simple and this delicious. Thank you for the reminder! Perfect! This will be my dinner tonight. I was planning plain frittata but I am loving the spread of veggies in between. I love a frittata, it’s my favorite way to eat eggs. Delicious! This is a very elegant frittata. I love frittatas for their ease of making and because they are great for using up leftovers. I would be all over this frittata! this is so pretty Jean! I love cast iron pans and just think they make everything even better 🙂 Thanks for your sweet comment, I know our move was very sudden- the whole process from the decision to winding up and packing, to our trip at the end of the month is going to be done in less than two months! As you can imagine it is absolute craziness here, but thankfully with many prayers and well wishes things are getting done one by one. Will miss you ladies! Keep in touch and hopefully we will meet again! I love this frittata! I am a huge Brussels Sprout fan and you are making my mouth water. I have not made dinner yet but this just might have to be on the menu soon. Hope your week is going well! Yum! 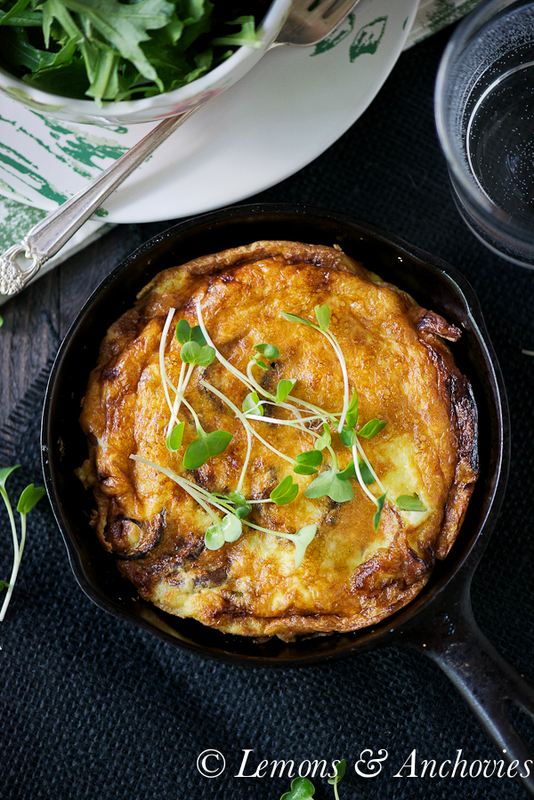 Gorgeous frittata 🙂 Eggs are a staple in our house – doesn’t matter if it’s morning, noon, or night – they make a quick and delicious meal! 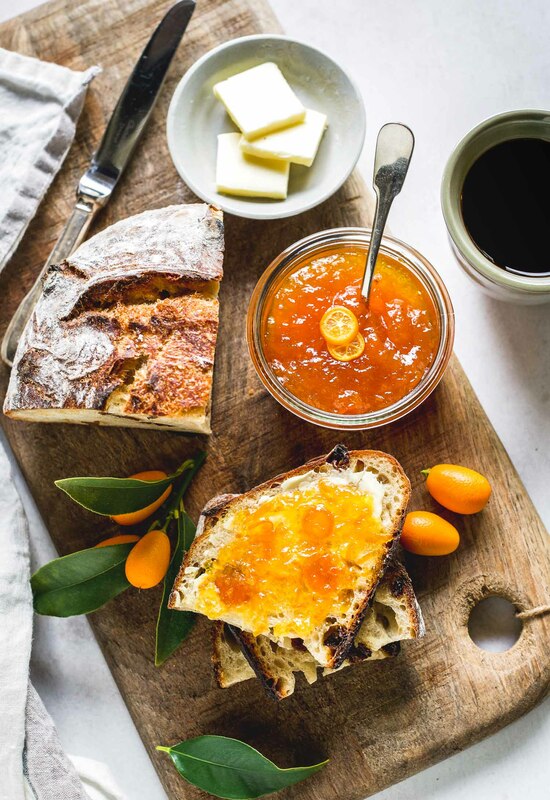 Perfect for breakfast, perfect for lunch and perfect for a light dinner. This would make me squee with pleasure. Frittatas and tortas, oh my! Yes, egg dishes or casseroles give me a comforting, fuzzy feeling inside. In my case, they remind me of a long, lingering weekend brunch! Speaking of eggs, we just had 2 kinds of frittatas for dinner tonight, what a coincidence! This just reiterates how hearty and earthy eating eggs is! YUM! I LOVE this! And I have a mini frying pan too (recent purchase). I’m going to try it this week. When it comes to savory dishes, I have more confident that I can pull this off…even though it “looks” like a cake (then I’d be a little more intimidated. haha). Great dish, Jean! What a great use of leftover veggies. So pretty layered in there like that! 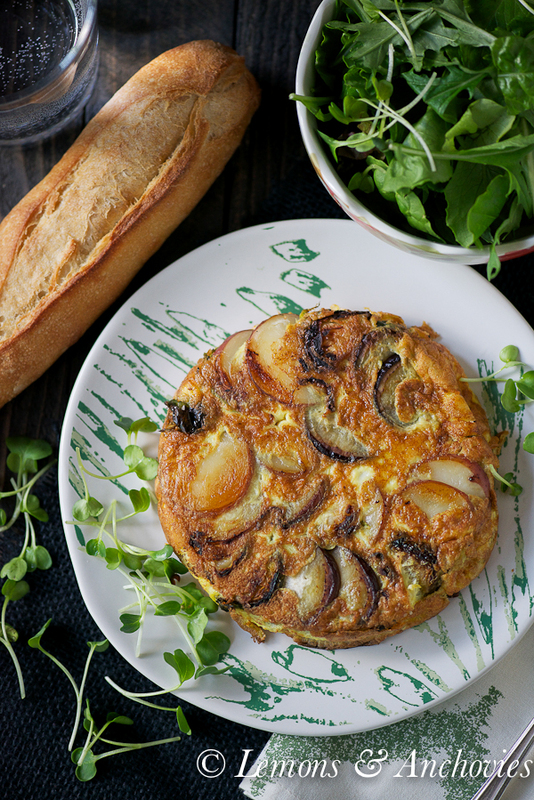 Beautiful frittata, I just love egg dishes they are so good and versatile.. I have to admit that veggies and eggs aren’t my thing but that last pictures?! Beautiful. Great job with it!